A clipper system will bring a mixed bag of weather to New Jersey on Tuesday. 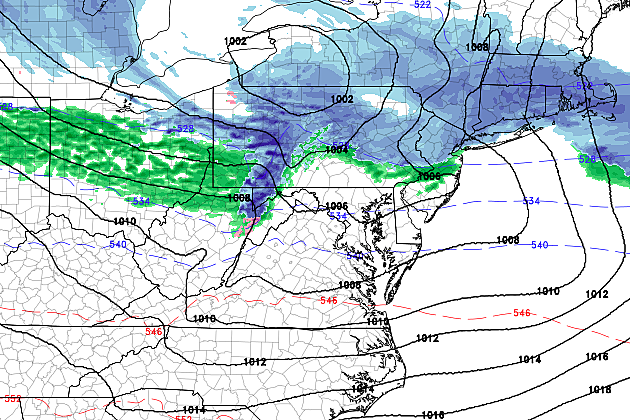 Another day, another clipper system, and another chance of snow. This time around, temperatures will play a huge role in determining precipitation type and associated weather impacts. This system has already brought snow showers to SW NJ, but the main event arrives later Tuesday morning. It is likely that the first couple bands of precipitation will fall as all snow. However, as temperatures warm from south to north, we will see a transition from snow to rain for most of the state. The ultimate rain-snow dividing line for this system looks to be Interstate 78. Along and north of I-78 (North Jersey), it'll be mostly snow on Tuesday, with a chance for 1 or 2 inches of accumulating snow. Between I-78 and about I-195 (Central Jersey), we could see a coating of snow on the ground at some point - it all depends on timing and snowfall intensity. For South Jersey, precipitation will be mostly rain on Tuesday. Overall, I'm not concerned about wintry impacts for the southern two-thirds of the state. Plus, what falls from the sky Tuesday should be on the light side. However, with isolated 3-inch snow totals possible in far northern New Jersey, a Winter Weather Advisory has been posted for western Bergen and western Passaic counties, in effect from 10 a.m. to 6 p.m. Tuesday. We'll see a big range of high temperatures from the top to the bottom of the Garden State on Tuesday, topping out near 30 to the north and in the mid 40s to the south. Snow showers and flurries will taper off Tuesday evening, with partly cloudy skies developing overnight. Lows will fall into the lower to mid 30s. Wednesday's forecast includes a chance for a shower, particularly for South Jersey. This shower chance is weak, although the morning run of the NAM model was pretty aggressive with rain/snow showers through Wednesday night. I think the day will just be partly sunny and breezy, but don't be surprised to see a few raindrops or snowflakes along the way. Wednesday will be mild too, with thermometers peaking near 50 degrees in southern New Jersey. But a cold front will put an end to the midweek warmup, as colder air returns by the weekend. Thursday looks quiet. Expect mostly to partly sunny skies, a stiff westerly breeze, and high temps coming down to the lower 40s. You'll really feel the chill on Friday and Saturday. Despite mostly sunny skies, a brisk west-northwest wind will keep temperatures from climbing above the mid 30s. We continue to watch a storm system for the Sunday-Monday time frame. While things have been looking good for a significant snowstorm, this morning's model run was a total dud. Typical for a 5+ day forecast, we've swung from a forecast of 8 inches to snow, to just snow showers Sunday night. Could the door swing back the other way again? Absolutely. But for now, this system looks to be mostly a "miss" - still worth watching, of course.